Over the holiday break Ecolincnz reached a significant milestone with our 10000th visitor. When the blog was launched on April 4th 2009 we hoped to provide information about ecology research being done in and around Lincoln University, particularly at the Department of Ecology. We weren't sure what to expect but we did hope that Kiwis, especially high school kids and their teachers, might like to see what was being done in their own backyard. We also hoped that a few overseas visitors might drop by. Since 5th April 2010 we have collected information on where visitors come from. Although Canterbury is the biggest source of visitors in New Zealand (1084) there are more visitors from the North Island overall. What is surprising is that 59% of our traffic is from overseas. one in four visitors are from the US with most of them from Califonia, Texas and New York - we have someone from every state except South Dakota! There is a large gap back to the next countries: United Kingdom (5%), Australia (4%) and Canada (3%). It's hard to know what to make of some of these numbers. Germany with 125 visitors seems low given the close links that Lincoln has with Gottingen University whereas 71 from the Philippines seems more than we might expect. For the single visitors from Iceland, Angola, Cambodia, Uruguay and the 20 other countries with one visitor we say welcome, come back soon, and bring a friend. At this stage we are still happy with how things are going, and we even use the blog as an assessment tool for our masters students, so we will continue to bring you details about ecology in our region. As Rowan Atkinson said "There is a certain level of uncertainty about, of which we can be quite .... quite sure". The problem with living in the information age is trying to deal with all of the information as well as the uncertainty. We need to have good filters to remove the noise and retain the signal. This is a real problem in biology where, with the advent of technology to collect DNA, there is far more data than we can often sensibly deal with. Another problem is that although there are often useful tools for making sense of the data they are usually scattered around the internet and can be difficult to find. A group of Lincoln molecular ecologists, including Rob Cruickshank and Stephane Boyer, have put time an effort into creating a tool to help identify species and to understand speciation. 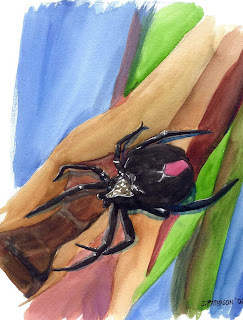 The package is called SPIDER and the details of what it can do are found in a paper from Molecular Ecology Resources. The SPIDER package (SPecies IDentity and Evolution in R)uses the the statistics package R (which is free to use) to develop tools to aid researchers in handling barcoding data. Genetic barcodes are regions of DNA (often the CO1 gene) that are unique to each species. Taking DNA from an unknown specimen, examining its barcode gene region and comparing with a DNA library allows that specimen to be positiviely identified. The SPIDER package provides summary measures of genetic distances between samples, assessments of variation and test of how accurate each match is are part of the statistics provided. SPIDER also implements a sliding window analysis that explores signal conflict within the gene region (not all data say the same thing) and allows the uncertainty to be shown in the evolutionary tree obtained from the data. The package is in constant development and there are tutorials and a manual available from the SPIDER webpage. If you are in the business of DNA barcodes then this will be a useful tool to add to your work. Of that we can be quite sure.